Custom Cakes and Cupcakes in CT - for any occasion. 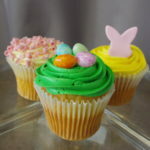 JCakes will be closed for Easter on Sunday, April 21st. Cakes for this date may be picked up the day before. We apologize for any inconvenience.